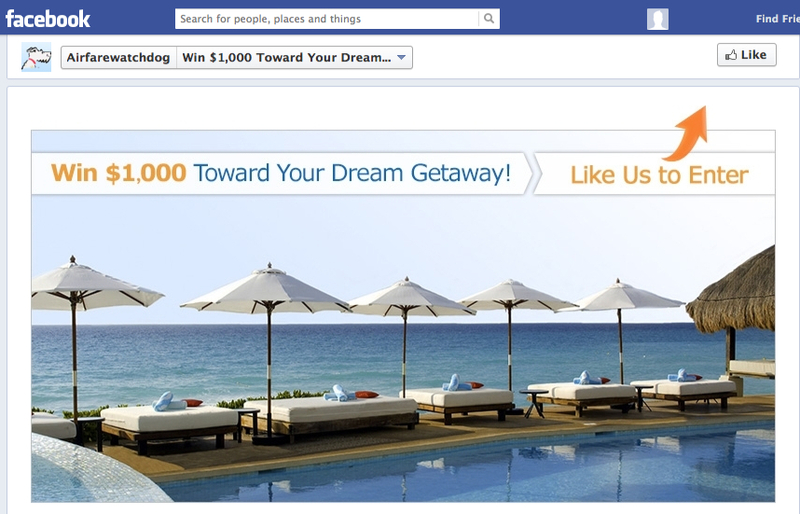 Adding your PromoSimple sweepstakes to your Facebook pages is now easier than ever. 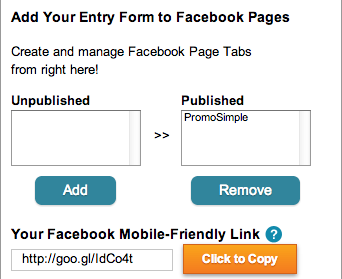 With just a couple clicks you can add your entry form to tabs on all of your Facebook pages in less than a minute. After you’ve published your campaign you will see options for embedding your entry form within a website, a link to your sweepstakes on a PromoSimple hosted page and the option to add your giveaway to Facebook. To add the promotion to Facebook you need to click on the Login w/ Facebook button (if you are not currently logged in) or the Authorize Application button if you are already logged in. This will open a window for you to authorize the PromoSimple Giveaway Tabs application. By clicking ‘Allow’ in this window you will give the application permission to add content to all of the Facebook pages that are you are an admin of. Once you have authorized this application a list of your Facebook pages will appear within the Publish tab of your campaign on PromoSimple. Within the list of Facebook pages that you are an admin of you can select as many as you want to add the sweepstakes to. A new tab will be created on each of the pages that you select and ‘Add’ to the Published list. Your entry form is now live on Facebook – easy! When you’ve added your giveaway to Facebook you can copy the mobile friendly link from the Publish section or from your Facebook page tab. This link will allow users on desktops and laptops to reach the Facebook page tab. Because Facebook does not allow most mobile devices to access this content, those users will be redirected to your hosted page, where they can enter the giveaway. If you want your campaign to be accessible only to your Facebook fans you can add a Facebook ‘Like’ gate to the tab on your Facebook page. Just below adding the entry form to your Facebook page you can check the box to enable the ‘Like’ gate feature. 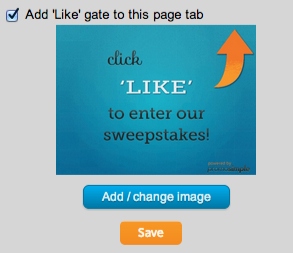 To add the ‘Like’ gate just check the box and click save. If a user that visits the Facebook page tab is already a fan they will not see the ‘Like’ gate. Pro Tip: By adding this feature (if your promotion is hosted only on Facebook) you don’t need to add a Facebook ‘Like’ to your entry form because all entrants must be fans of the page to access your entry form. After you’ve added your entry form to tabs on Facebook pages you can go to the pages to edit the icon and text used for the tab icon on your Facebook page. By default this tab will use the text Giveaways & Promotions. Click on the button to the right of the tabs and then click on the pencil (edit) icon on the Giveaways & Promotions tab. This opens a menu (shown below). Select the ‘Edit Settings’ and a new layer will open for you to customize the text and image. On this layer you can change the text from Giveaways & Promotions to any text you want to use. You can also upload your own image to be shown on your Facebook page for the tab. Images can be JPG, GIF, or PNG files. If the image is larger than 111×74 pixels, it will be resized and converted to fit in the space. The file size limit 5 MB.